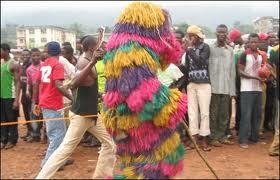 Ado Ekiti-In a bid to curb harassment of people of Ado-Ekiti by masquerades, the Ewi of Ado Ekiti, Oba Rufus Adeyemo Adejugbe has placed a temporary ban on the masquerade festival in the town. The ban, according to a reliable source was a fallout of the persistent harassment of people and barrage of complaints lodged at Ewi’s palace by those manhandled by adherents of the masquerade. The monarch also called on the Police to arrest any masquerade or masquerader seen in the town. Adherents of a certain masquerade called ‘Paragogo’ being worshipped by Odogun family in Oke Iyinmi in Ado Ekiti, were said to have been arrested over the weekend, following alleged harassment of traders operating at Erekesan Market and other areas in the capital city. Vanguard gathered that some of the masquerades and their followers, who normally go on rampage, brandishing long cudgels and charms, were in the habit of coercing the traders and passers-by to pay money or part with food items, failing which they would be flogged severely and inflicted bodily injuries on the victims . Oba Adejugbe, in a paid advert aired on the state owned radio version of the Broadcasting Service of Ekiti State, BSES, told the Commissioner of Police, Mr Etop James, to carry out the order in the interest public orderliness in the capital city. The monarch also warned chiefs against flouting the order, saying they would be held liable for any breach of public peace if any masquerade traceable to their quarters should defy the temporary ban.